Weekend GetAway in the middle of Wine Country! Eat, Drink, Play! The perfect house for our group....gorgeous!! Great for a large group! We loved our stay at the Sunset Vineyard Estate. The setting was spectacular and private, which was exactly what we were looking for. The house layout allowed for a lot of privacy (even for the jack-and-jill bathroom), the decor was beautiful, TVs more than plentiful, and everyone raved about the comfortable beds. However, We arrived to ants in the kitchen and a freezer full of water. 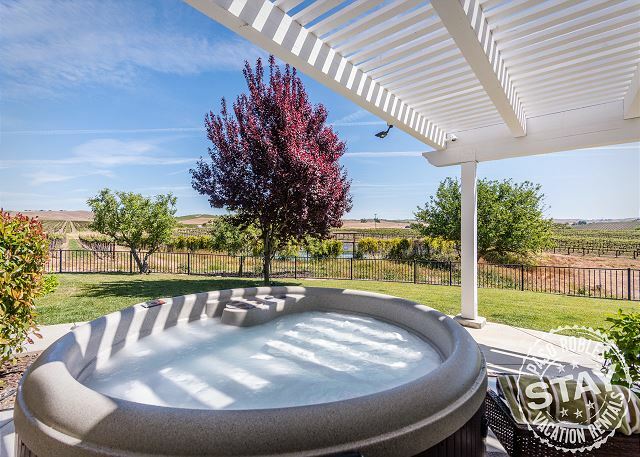 Although Paso Robles Vacation Rentals seemed very on top of things and attentive, we didn't want to bother them with it and fixed those issues ourselves. We also had to improvise a bit on the equipment side. One large pan & pot, one mixing bowl, one (!) tea towel and no hottub/extra towels for a 5-bedroom house is simply not enough for dining and staying together, so we bought extras. We had a group of 6 wine tasters stay the week for WineFest. The location was perfect. Many wineries in the area, town of Paso about 15 minutes away. Easy access to locations north of Paso. Beautiful countryside. Throughout the week we cooked dinners, tasted wines, visited the air museum and enjoyed the sights. Each day started and ended with coffee or wine on the back porch overlooking the vineyards, listening and calling the many birds in the area. This place is lovely, it is not your typical rental at all. The ENTIRE house is top notch and is bigger than it looks in pictures. We are planning to stay here every time....we found a gem, so please take good care of it. There are two LARGE rooms on opposite sides of the house with three med. sized rooms in between, there are plenty of bathrooms and rooms/places to "get away" from everyone in....we had 8 adults in the house and did not feel cramped at all. There is a fully stocked kitchen, (with utensils, pots, pans, plates, glasses)a big refrigerator and huge pantry. The patio is lovely with two tables and plenty of chairs. It has a spectacular view of the vineyard and has a big propane powered BBQ (with plenty of propane available). The house is pretty secluded which was a nice surprise and the vineyard's tasting room is within walking distance. We arrived at the site of a beautiful home with beautiful views and serene surrondings anticipating a well kept home. Our expectations were delivered and then some. The time went by very quickly and we could even see the fireworks in town. The drive into town was quick and the hustle and bustle left behind. There was hardly a car or truck to hear. The back yard was a joy given that the shade was plentiful and the view of the horses grazing on the neighboring hills could be seen everyday. The process was turn key and everything in the home was in great condition giving us the time to devote our full attention to our guests. The property was exactly as described in a lovely rolling hills vineyard setting. Our adult party of 7 enjoyed the spaciousness of the home with multiple sitting areas and fabulous dining room.